Dimensions 1.25 by 8.25 by 10.25 in. 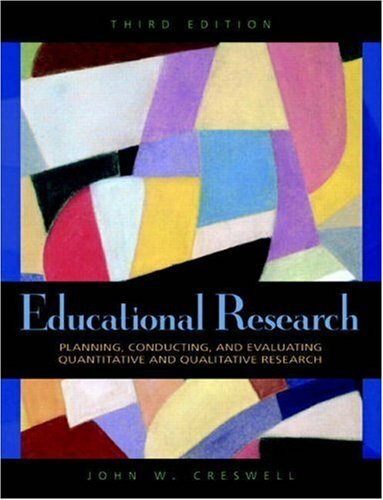 Amazon.com description: Product Description: Educational Research: Planning, Conducting, and Evaluating Quantitative and Qualitative Research, third edition, is appropriate for courses in Introduction to Educational Research.ÃÂ This successful core research text is known for its truly balanced coverage of qualitative and quantitative methods. The author'sÃÂ clear and practicalÃÂ writing has made this book a favorite among instructors and students.ÃÂ In clear step-by-step language the text helps students learn how to read and evaluate research studies.ÃÂ Key changes include: updated quantitative coverage, expanded coverage of ethics, and new research articles.ÃÂ ÃÂ For future teachers.